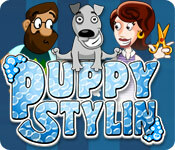 Puppy Stylin` is rated 4.0 out of 5 by 13. Rated 5 out of 5 by beltie from Sooo Cute. Hidden Gem!! A very enjoyable TM game, along the lines of Diner Dash. Good controls, excellent storyline, nice upgrades available. Clear, crisp graphics. The animation is fantastic. Good replay as well. The pups all have different personalities, as do their owners. If you leave a pup too long, it begins to growl and then howl. If it's happy, it expresses that too. Super cute. I enjoyed this game sooo much, that I have actually played it more than 4 times. Depending on which pooch you choose, you get a different litter at the end ;) It is a good play for everyone, and for pretty much every experience level. I would love to see a sequel to this. It truly is a Hidden Gem!! Rated 5 out of 5 by sparklefish777 from Fun Puppy Game! So far I've only played for about an hour. However, I love what I've seen so far. You get to groom different pet dogs. The owners and their dogs are really cute and quirky! And the graphics are cute. So far, I've washed, trimmed, and dyed the puppies. Give dog treats or toys to make your guests more patient. You move to different grooming salons throughout the game. In the first, you're in a backyard, then on to a cabin, and there are a lot more shops to progress to! Another bonus is that you can participate in a doggy fashion show before you move on to your next dog salon. Very fun! Rated 5 out of 5 by YoungRider77 from Amazing! I Loved this game! It looks like a little kids game but actually I really enjoyed it!! Rated 5 out of 5 by Sniffsmatte from Very Very Good Very funny! Some technical problems but you could overcome them. I really recommend this game. And also it's so cute! Rated 4 out of 5 by pennmom36 from Puppy Stylin' I stumbled across this Time Management game by accident and since I have owned and operated a Grooming Salon for over 30 years, I just had to check it out. It's really a decent game, but the graphics have room for improvement. You decide to set out a shingle and open up a grooming business in your back yard, which eventually moves to a more professional location. You choose to portrait a male or female character and you choose which dog to adopt from an assortment of breeds from purebred to pure mixture (daddy was a champion fence climber) this is the dog you will be showing in the upcoming dog shows. When the puppy clients arrive, they have a specific service in mind, and you simply click on the dog and drag them to that specific station such as, the bathtub, the styling station (choose the style the dog smiles at) and the blow drying station. when they are finished, you drag them to the register station where the owner will pick them up and pay you. You can make dog bones and serve them to the puppies to keep them happy if they become impatient and lose a heart. The faster you serve them, the happier the dog will be and the bigger the tip you receive. The money you earn can be used to upgrade your shop with more service stations or things to make the puppies happier. Some dogs have stars instead of hearts and the stars are used as hints at the dog shows. Every few levels you get to show your adopted dog in the local shows. There are four categories you are judged on such as hairstyle, clothing, color and accessories. You can use the star coins you earned as hints that will highlight two of the four selections, you must make the final decision. This is a really cute and fun TM game for groomers and dog lovers, enjoy! Rated 4 out of 5 by crissie001 from Recommend. 60 levels. Fun and some what challenging. 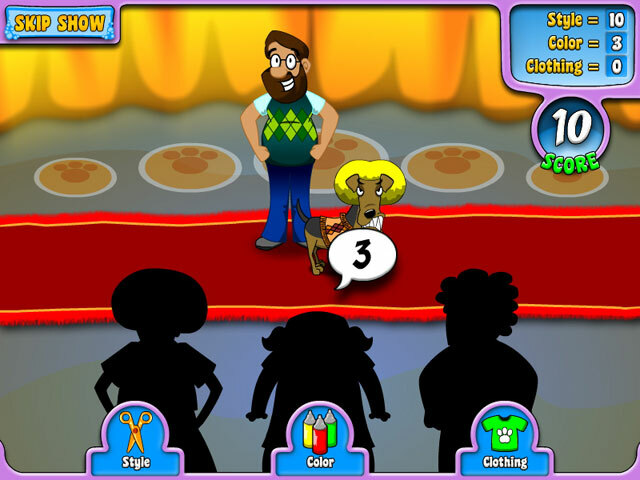 In this game, you style dogs of a few breeds, enter into a dog show and earn trophies to collect. It's a chain style type of game (like Diner Dash) I would recommend for any age. 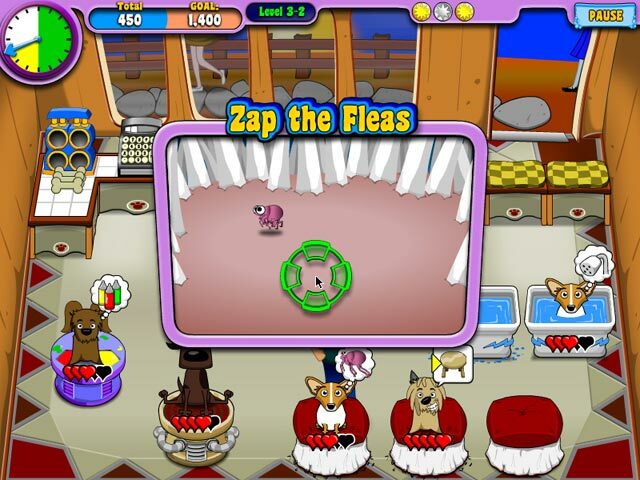 Rated 3 out of 5 by Lisa522 from Cute game Cute game that is somewhat humorous as you care for dogs that come in requesting new clothes, baths, haircuts, flea treatments, being brushed, dyed, blow dried, etc. There seem to be a LOT of levels in this game so game length should not be of any issue. Every 10 levels or so? there is a dog show feature, which is cute. The only thing that was really getting old quick is the load time between levels. It's not long, maybe 3 to 4 seconds, but in this day and age of everything immediate, it was kinda offputting. Also can be hard to brush the animals quickly as the mouse movement (my own) can not be as smooth as you want (going in a curvy shaped line, for example). Still, fun game worth playing. I purchased before demoing and while not sure I still would have purchased, I'm not upset with my purchase. Nice game if for no other reason than some variety. Graphics and game style seem rather simplistic, which makes the load times seem even more out of place. Just my two cents.